Galaxy Core: How Do I transfer audio, video, or other types of files from the device? The following file formats are supported by some applications. Some file formats are not supported depending on the version of the device's software or the computer operating system. If the applications cannot play files in divx or ac3 format, install applications that support them. 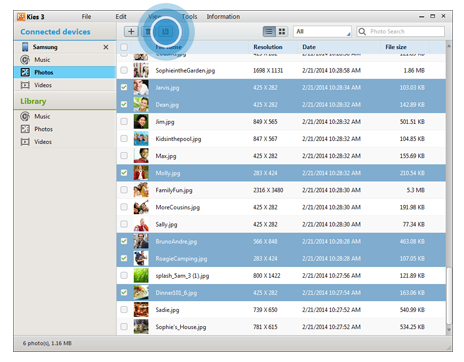 Samsung Kies is a computer application that manages media contents and personal information with Samsung devices. Download the latest Samsung Kies from the Samsung website. 1. Connect the device to the computer using the USB cable.Samsung Kies launches on the computer automatically. If Samsung Kies does not launch, double-click the Samsung Kies icon on the computer. 2. Transfer files between your device and the computer. Refer to the Samsung Kies help for more information. 1. Connect the device to the computer using the USB cable. 2. Open Windows Media Player and sync music files. 2. Open the notifications panel, and then tap Connected as a media device → Media device (MTP). Tap Camera (PTP) if your computer does not support Media Transfer Protocol (MTP) or not have any appropriate driver installed. 3. Transfer files between your device and the computer.